Traffic in midtown can be brutal at any time of day, let alone during lunch or rush hour, and nobody knows this better than Jerome Chang, a 2004 grad from The FCI who started Dessert Truck in late October of 2007. Operating out of a converted delivery truck that’s been pimped out with modern restaurant equipment and repainted with a funky logo, he makes his way through car and people-jumbled streets day after day in search of Manhattan’s version of El Dorado: a legal street parking spot. Even in the most compact of vehicles, it can be a hair-pulling task, but Jerome says that securing a spot with his behemoth-sized hunk of metal and tires is often his most challenging moment of each day, one that often entails circling and waiting for over an hour for a spot to open up, and sometimes giving up altogether. The Parking Gods were with us the day I rode along with Jerome earlier this week, as we swiftly made our way from the preparation space he rents out in Hell’s Kitchen to his daytime location on 55th and Lexington. I climbed out of the truck to help guide him as he parallel parked with surprising ease into an open spot while lunchtime customers already lined up to load up on sweets. Parking is just one of the many obstacles Jerome has encountered since starting his successful mobile venture of serving decadent restaurant-style desserts in an unexpected, ice cream truck-like setting. Foul weather and mechanical failures are an unfortunate pair of business-closing obstacles that, while stressful to contend with, at least give him a cherished day off once in a great while that Jerome uses not for rest, but to conjure up sweet new creations, such as the meringue, mousseline, red fruit gelée, and yogurt ice cream that will debut on the menu soon. His popular goat cheesecake with rosemary caramel and fresh blackberries is also making a return to the menu this week. From the looks of the consistently long lines that form outside of Dessert Truck’s evening location on 3rd Avenue and St. Mark’s Place, I would have never guessed that the issue of high end dessert acceptance ever existed. I got in line late last night and witnessed a slew of young East Village hipsters eagerly snatching up order after order of molten chocolate cake with olive oil, sea salt, and vanilla ice cream and bread pudding with a choice of vanilla or bacon custard sauce, Jerome’s two best-sellers and staples that remain on the menu year round. But Jerome insists that New York is possibly the only city that could have supported his business model from the outset, yet in that same breath excitedly adds that expansion to other cities is something that he’s frequently weighing and considering, although he remains mum on precisely which cities he's contemplating expanding to. Growing up in Prairie Village, Kansas (a suburb of Kansas City), Jerome didn’t have many obvious foodie influences to build from in his own immediate family. “I always loved food, but maybe never fully acknowledged my passion for it. It was like something one grows up with but never really notices until they've come back home after a few years in college.” Jerome thinks that, no matter how successful any business becomes, it’s all about teamwork and approaching each new assignment with humility and respect, values he projects regularly upon himself and his current staff of eight employees. When I asked Jerome where he sees himself in five years, he laughed and replied playfully, “Sitting on a beach somewhere in Mexico, with a small kitchen set up somewhere for creating new recipes.” And with his talent, diligence, and determination, I’m betting he’ll be soaking in the rays there sooner than he thinks. My guess is, though, that he wouldn’t stay there for long—he loves his job too much. And that’s a good thing for fans of Dessert Truck such as myself, who can’t go more than a few days without a shot of the super rich hot chocolate. Dessert Truck operates Monday - Friday from noon – 3PM on 55th and Lexington Avenue, and daily from 6PM – midnight on St. Mark’s Place and 3rd Avenue. 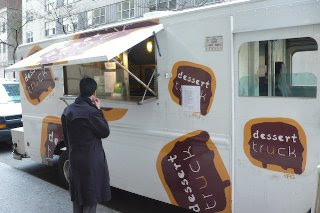 For more information, including what’s currently on the Dessert Truck menu, visit DessertTruck.com. Things started out with a bang in Week 4 as we hailed the arrival of Chocolate Week…which, sadly, turned out to be merely Chocolate Day (I misread the syllabus. But we'll return to chocolate again at several points in the curriculum). One class was more than enough chocolate for me in the end, however, as I wound up devouring an entire chocolate ganache tart by myself while watching American Idol’s “Songs From the Year You Were Born” week late Tuesday evening on a self-pity-soaked couch. One of the contestants popped into this world way, way back in…1992. 1992!! The thought was all too much for me to take, as she warbled Bonnie Raitt’s “I Can’t Make You Love Me Anymore,” that I could have been her daddy. And so I kept eating. We also made a Bavarian chocolate tart in class that, thankfully, didn’t suffer the same gluttonous fate and was instead enjoyed by friends in a (presumably) much more civilized fashion. 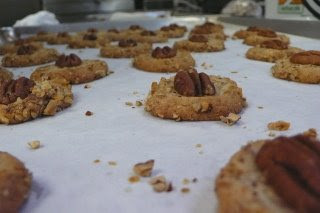 Thursday’s caramel theme found us concocting delicious caramel nuts tarts and mini tarte tatin, with pecan bourbon cookies thrown in for good measure. Chef Kir Rodriguez, a former Franciscan monk-turned high school teacher-turned pastry chef (!! ), stepped in for Chef Cynthia, who was out in observance of Passover. We had a lot of fun with him, and it was interesting seeing the difference in teaching styles between him and Chef Cynthia and how it changed the rhythm of class. Not surprisingly, Chef Kir gave off oodles of calm energy that must have been leftover from his time at the monastery and helped to balance the nervousness that sometimes pokes through when I’m tackling new recipes. 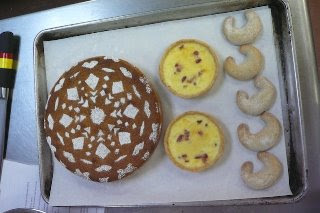 Linzer tortes and quiche Lorraine were the star subjects in Saturday morning’s class. 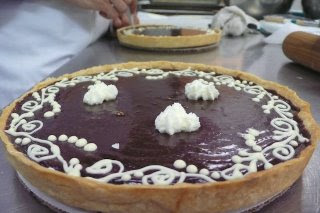 Chef Cynthia returned and taught us how to make a lattice weave on our tortes. We spent the last hour of class reviewing for our first practical and written exams. Our last test on sanitation (which I ended up passing, by the way!) 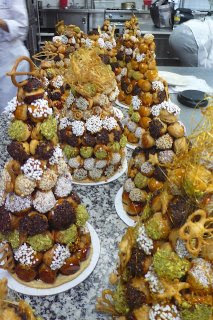 is regulated by the state and doesn’t affect my overall grade in class, while the practical and written pastry exams do. I’ve been studying for it since the end of class on Saturday and feel okay about the written portion, yet mostly uncertain about the practical exam, which entails making three recipes of Chef Cynthia’s choosing from the repertoire of tarts and cookies we’ve made to date and presenting them for judging by the end of class. It will be interesting to see how it all pans out, and I’m sure I’ll have a lot to report on next week. And not just on the test, as week five also marks the beginning of a new unit—Pâte à Choux, where we’ll dive into making éclairs and profiteroles, among lots of other yummy things. I’m looking forward to it, but first I’ll concentrate on getting through this exam…think good thoughts! We’re getting ready for the April 14 start of Pastry Techniques, the 100-hour intensive class that puts amateur bakers into The FCI’s kitchens. The class covers the essential French pastry doughs that form the basis of so many desserts, plus tarts, custards, mousse, cakes, cookies, sauces, and soufflés (and more). In short, it’s the perfect class for anyone who wants to develop a thorough foundation of pastry techniques and to get hands-on guidance from experienced instructors. One of our favorite recipes from Pastry Techniques is the Reine de Saba or Queen of Sheba. It’s a decadent cake with an evocative name, first brought to America's culinary consciousness with the publication of Julia Child’s Mastering the Art of French Cooking. The Reine de Saba contains good quality chocolate, almonds, and only a little bit of flour, giving it that rich, creamy consistency that makes a chocolate addict’s heart flutter. The FCI’s version is made more decadent and complex with the addition of brandy and amaretto and a simple chocolate glaze. Please enjoy the following recipe, courtesy of The FCI’s Pastry Arts Department. Visit our web site to learn more about Pastry Techniques. Butter and flour two 6-inch cake pans and set aside. Preheat the oven to 325°F. Melt the chocolate and butter in a clean, dry bowl over simmering water. When the chocolate is half-melted, turn off the heat and stir to finish the melting. This prevents the chocolate mixture from being too hot. Whip the egg yolks and 75 grams of sugar until light and pale (blanchir). Add the liquors slowly, whisking until the mixture to become homogeneous before adding more. Stir in the almond flour. Prepare a French meringue with the egg whites and the remaining sugar.Fold the chocolate and butter into the egg yolk mixture. Fold the meringue into the chocolate mixture leaving the meringue slightly streaky and start adding the cake flour to prevent overworking the batter. Fold the batter into a buttered and floured cake pan and bake at 325F for 30 to 40 minutes, or until a skewer inserted in the center comes out clean but moist—a few small crumbs may stick to the skewer but it should not be covered with batter. When the cake comes out of the oven, it is too fragile to be unmolded and should be allowed to cool completely in the refrigerator before removing from the pan. Unmold the cooled cake. If it does not come out of the pan easily, warm it slightly over an open burner and then turn it out onto a cardboard disc. Combine ingredients for the glaze in a bowl over a bain-marie. Melt and use at body temperature. Place the cake on a cooling rack and pour the glaze on, starting with the sides and finishing in the middle. The cake should be tilted to let the excess run off quickly—one pass can be made with an offset spatula. This cake should always be served at room temperature, but stored in the refrigerator or frozen. Lemon tarts are one of my all-time favorite desserts in the world. I like them best when they come loaded with a big, puckery punch of lemon curd and not too much sugar to dampen the zing. 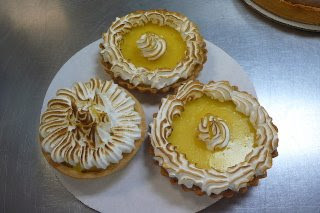 As luck would have it, this week we made the zippiest and most potent lemon tartlets I’ve ever had, and they were divine! We finished the tartlets with piped meringue in seashell patterns that I’m still getting the hang of piping correctly, and then fired them with pastry torches. I felt my tartlets looked a little too much like the ones I see spinning around in the rotating dessert display at the diner next to my apartment. Not that there’s anything wrong with that! This week we also made an onion tart laced with tomato and Roquefort that was so good it didn’t last 15 minutes at my house and was ravenously devoured by visiting friends. And it was so easy to make that I’ll be adding it into the mix of things I regularly bake around the house. 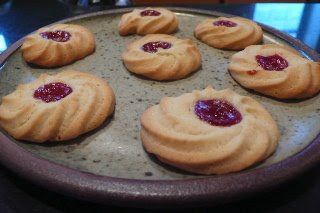 Little jam-filled spritz cookies (pictured at right), French nut tarts and blueberry clafoutis were also on the class baking schedule, making me officially overloaded with treats and the most popular guy amongst my friends since starting school. I’ve already developed delivery routes of eager friends’ abodes where I can chuck the goodies on my way home so that I don’t end up eating them all myself. It’s official: Spring is here. And you can feel it in the air in New York City. For a little while at least, the city feels (almost) fresh. Here at The FCI the chefs seem to have an extra bounce in their step—no doubt they’ve got visions of asparagus and strawberries dancing in their heads. Our own Lee Anne Wong is gearing up for a little spring celebration of her own. On Monday, April 6 she’ll be teaching a Recreational Division class at The International Culinary Center. Click here to sign up. We spoke to her earlier for a sneak preview. Tell us more about what you have planned for Monday night. You teach regularly here and design your own classes. What’s the inspiration behind this one? I just love this time of year. It’s been a long, hard winter, and now we get to see everything turn green. I love chili and short ribs and all of those slow-cooked winter dishes. But there’s nothing like peas and fava beans and rhubarb—those fresh flavors you can only get during spring. I’m going to show everyone a handy short cut for making ravioli. You’ll be able to cook up a quick and easy vegetable pasta dish at home. People are often intimidated by crêpes, but they really are easy and versatile. I’m going to show the class how to make a basic batter and how to properly cook and form them. We’ll talk about different ways to use them in other recipes, too. But for this class, we’ll fill them with sweetened goat cheese and serve them with a rhubarb vanilla sauce. 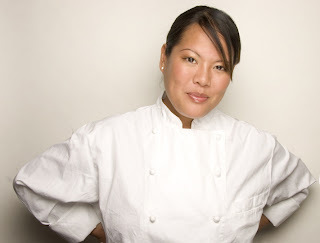 Cooking with Lee Anne Wong runs on April 6 from 6-10pm at The International Culinary Center. After three hours of hands-on instruction and cooking, the class will sit down together to enjoy a meal of vegetable ravioli, fish en papillote, and goat cheese and rhubarb crêpes with wine - $195.